Kanchanaburi War Cemetery, Plot 10, Row L, Grave 13, Age 47. Tarsau, Kanu II, Nacompaton and other camps where 'S' Battalion were sent. Mergui Road. 12 Kilo Camp, Mergui Road. 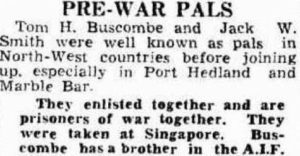 Jack was selected to leave Singapore to work on the Burma-Thai Railway with ‘D’ Force S Battalion. They departed Singapore by train on 14th March 1943, arriving Bampong, Thailand after 4 days of hellish, crowded conditions. S Battalion was first trucked to Tarsau Camp where they worked for a few weeks, then to Kanyu II (Hellfire Pass). We are not certain where he went after that, men from S Battalion were split into groups and sent either to Kinsaiyok, Chunkai, Hintok or other camps in the region during “Speedo”. In 1944 John was most likely at Nacompaton Hospital Camp having survived working on the railway since march 1943. It was here in April 1944 he was selected with up 1000 POWs to form a ‘work party supposedly for light duties in Malaya’. This was a typical Japanese lie. These 1000 POWs were joined by 11 Medical Officers and orderlies and together the 10011 POWs with a large force of Asians began slaving on the construction of Mergui Road Escape route in southern Burma where the region was mountainous and conditions tough for the already undernourished and nearly all ill POWs. He was one of at least 7 or 8 men from 2/4th who left Thailand with this party. Read further about Mergui Road Escape. He died ‘officially’ from malaria at 12 Kilo Camp on Mergui Road 17 July 1945 and buried at 12 Kilo Camp Cemetery in Grave No 63. He was recorded as being 42 years old – once again this may be incorrect as his enlistment details say he was born in 1897. From above notices we note Jack was good mates with Archie Newell and pre-war with Tom Buscombe. 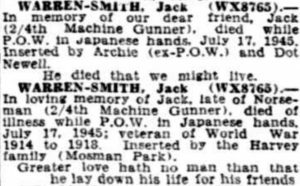 Having researched military and other records, we cannot find any details for Jack’s earlier life, and certainly not in WW1 Records. However there is a John Donaldson Smith, born in Warren NSW to Peter Smith and Hope Louise Eastman. Records show he was 18 years old when he enlisted in 1916. 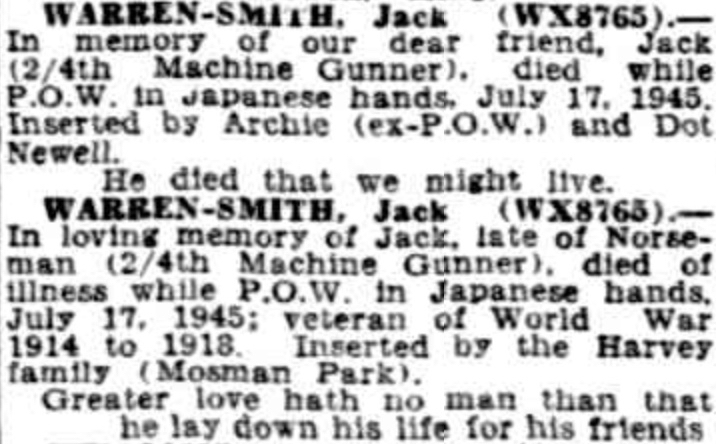 The parents both died at Deniliquin 1939 and 1944. This John Smith was 18 years old when he enlisted at Roma, Qld. April 1916 with 13th Machine Gun Coy, 7/47th Reinforcements. He gave his occupation as grazier. His parents were living Mt Alfred, Wyandra, Qld. about 700 kms west of Brisbane – they had to include the signatures as he was only 18 years old however Jack had been living in Victoria and only recently moved to Qld. Hope Eastman came from a large family living in Victoria or NSW. She had a married brother Kenneth McAskil Eastman, Solicitor, in Bunbury, WA, living with his wife and at least 2 sons who were students of law. Hope’s sister Janet Mary Eastman (unmarried) was also living with the family. (possibly a reason John Warren-Smith came to WA) – there are no records for him in WA Electoral Rolls and Warren-Smith family name is very uncommon with few recorded families. It is possible John Donaldson Smith is John Warren-Smith from 2/4th. John Donaldson could have changed his name to include Warren the place of his birth. Enlisting in both WW1 and WW2 did not require a bundle of identification documents. It is also possible he married and was living in Sydney in 1934 – and if so, the reason he recorded his birth as Perth. The only other option was John William Smith, aged 33 years from Victoria whose NOK was his married sister Jessie C. Warrren. However his age is not within the range. John was prospecting and living at Norseman when he enlisted. He apparently was about 3 years with 10th L/H before joining 2/4th in October 1940. His recorded NOK was initially Mr M.J. Coyle, Norseman and then changed to Constance Smith, Friend.